The Chicago Blackhawks got outplayed again on Saturday against the Florida Panthers, but perhaps a dominant third period that led to a come-from-behind win holds the key to success. 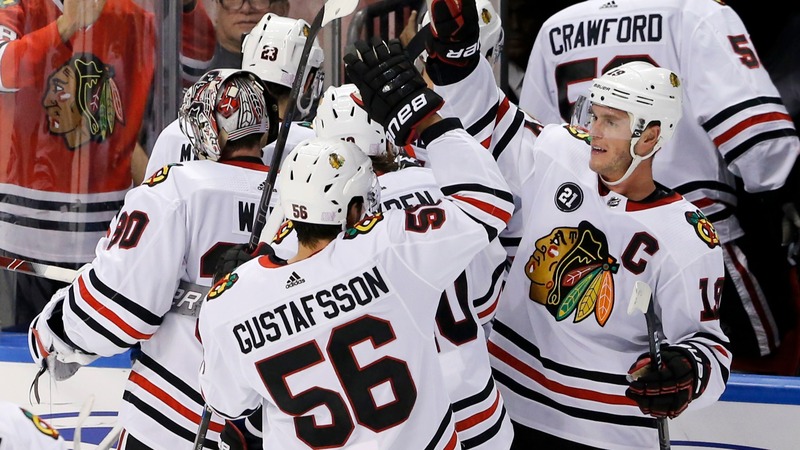 For the third time in four nights, the Chicago Blackhawks were thoroughly outplayed on Saturday Night. However, after a dominant third period led to a come-from-behind win in overtime, perhaps there was something to be gleaned. The Blackhawks looked like they were getting beat to every spot on the ice [for the first 40 minutes. ](https://www.naturalstattrick.com/game.php?season=20182019&game=20351&view=limited) They were outshot 30-10 at even strength in the first 40 minutes and gave up 14 high-danger scoring chances while generating just two all while the Panthers dominated possession. However, lucky to be trailing just 4-2 entering the final period, the Blackhawks found their groove rather suddenly. They dominated with 18 shots and 18 scoring chances (six of the high-danger variety) for and only four of each against. __Play to win:__ [Enter our free contests for swag and even cash prizes! ](https://betchicago.chalkline.com/) Despite all that success, they still couldn't muster an even-strength goal. Instead, they had to rely on an unassisted, short-handed goal by Alexandre Fortin and an improbable net-front goal from Alex DeBrincat with 0.8 seconds remaining and the goalie pulled to send it to overtime. There, the Blackhawks continued to ride the momentum in 3-on-3, generating all the extra period's shots and scoring chances before Erik Gustafsson gave them a win. <a href="https://twitter.com/NHLBlackhawks/status/1066531069028007938/video/1" class="embedly-card" data-card-width="100%" data-card-controls="0">Embedded content: https://twitter.com/NHLBlackhawks/status/1066531069028007938/video/1</a> Now, the key for the Blackhawks will be in figuring out how they seemed to magically unlock their potential in that span. Philosophical shift seemed to have something to do with it. The Blackhawks were less hesitant to take advantage of whatever shooting lanes that the Panthers were giving them and that led to tip and rebound opportunities in the front of the net before eventually expanding the Panthers defense and resulting in those high-value scoring chances. General tentativeness has been a problem all season for the Blackhawks, rearing its head most notably on the power play. So seeing the Blackhawks taking what the defense was willing to give and then getting bodies to the front of the net to find new ways to create chances was refreshing. Of course, dominating possession was also key. The Blackhawks had a Corsi-For percentage of nearly 76 in the final period and that rose to nearly 86 percent during the 2:32 of overtime they played. __More:__ [Corey Crawford resolved to carrying Blackhawks](https://www.betchicago.com/corey-crawford-carrying-chicago-blackhawks) Those aren't sustainable numbers long-term, but those numbers do lend themselves to a "best defense is a good offense" strategy to help mitigate some of the blue line issues we saw on display yet again on Saturday. Perhaps they can use the Saturday third-period film to rework the lines to make possession a more realistic goal for all of their lines and relieve some of the stress on the defense. Whether or not that's a realistic solution, it's too early to say, but the point is that the Blackhawks played one of their best periods of the season in the third period. Now they have to figure out why it was their best period and how they can make that translate in broader situations. The Panthers aren't very good. So it's important not to get too excited if you're a Blackhawks fans that this is guaranteed to be indicative of something larger. Right now, all we know is that the Blackhawks just took two points from a game where they deserved none. On the absolute fringes of playoff contention in the early portion of the season, that is important in and of itself. But if the Blackhawks *can* take the good of that final period while discarding some of the bad from the first two periods, it is possible that they can start to turn things around.